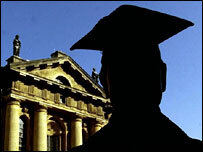 Is it wise to go to university, or is it better to teach? Professor Russell Ackoff is an 88-year-old subversive. He is also a business school professor emeritus, which makes what he has to say about education in general and business education in particular even more interesting. In London to launch his new book on management flaws, or F-Laws, Professor Ackoff's central point was this: "We have to understand the whole before we can understand the parts - what matters is their interaction." Easy to say, but hard to learn, even for the world's business schools. "Business schools are way back," says the professor. "They're behind even corporate practice. They are a major obstruction." Business schools continue to teach everything in separate parts rather than learning how marketing or production interact, he argues. In fact, there are more engineers than business school graduates at the top of US businesses, the professor explains, and that is good because coming to a problem de novo, they are more likely to see how organisations interact. "We don't have internship in management, and management has yet to become a profession," he says. "It pretends to be so, but it isn't." Even so, he also thinks that learning on the job has its own problems. "You never learn by doing something right, because you already know how to do it. The only opportunity for learning is to identify mistakes and correct them," he says. "If you are in an organisation which says that mistakes are a bad thing, learning is suppressed. So you either try to avoid mistakes, or if you make them, you shift blame to someone else." Professor Ackoff says the worst kind of mistake is not being wrong, but something you did not do that you should have done. "Errors of omission are responsible for failures, and bankruptcy," he adds. But how is that to be recognised when the accounting system in Britain and the US have no record of sins of omission. The accounts record only acts of commission. So all you have to worry about, as an employee, is doing something you shouldn't have done. Professor Ackoff thinks that companies need a recording system of every boardroom decision not to do something, together with the expectations associated with it and the assumptions on which the decision was based. Then they should keep track of what happened on the roads not taken. Professor Ackoff has lots more to say about education. "Information is more valuable than data, and knowledge more valuable than information and understanding more valuable than knowledge," he contends. "We devote all of our time and energy to information and a little bit to knowledge. None to understanding and still less to wisdom." The professor thinks education requires a major transformation because being taught is one of the worst ways to learning anything. Today we confuse teaching with learning, and the one who learns the most is the teacher. "Anyone who has ever taught a [university] course is well aware of the fact that the person who learns the most from a lesson is teaching," Professor Ackoff says. Schools have got it upside down, he adds. "You can't learn unless you can teach. The old fashioned one-room schoolhouse was a room in which students taught students, and the teacher was merely a source available for help, not someone who spoke at them, spilling adult knowledge. "We need a remaking of schools." "The current school provides no motivation for continuous learning at all. It forces a student to learn things they are not interested in, exactly the reverse of what it ought to be doing." There is another handicap for today's student - in front of them are machines that can do far better what he is being asked to do. Students need to know how to control the machine, not to do what a machine can do better. Apprenticeship, says Professor Ackoff, is the best way to learn anything. I suspect that is not as old fashioned as it sounds. Professor Ackoff's book "Management F-Laws: how organisations really work", with Herbert Addison and Sally Bibb, is published by Triarchy Press. Work in Progress is the title of this exploration of the big trends reshaping the world of work as we steam further into the 21st century; and it is a work in progress, influenced and defined by my encounters as I report on trends in business and organisations all over the world.